Jack Richard Steel, 67, of Wamego, KS passed away after a courageous battle with MDS Leukemia, at his home on Thursday, July 20, 2017. On January 31, 1950, Jack was born to Robert and Bonnie (Heltebrake) Steel in Toledo, Ohio. Jack graduated from Maumee High School in 1968 and attended the University of Toledo. 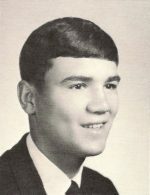 He was united in marriage with his high school sweetheart, Pat Bellner, on June 26, 1970 at St. Patrick’s Catholic Church in Toledo. While in Toledo, Jack worked for Libbey Owens, Tru House of Munch and Phillips Petroleum. Phillips Petroleum relocated Jack to Beatrice, NE in 1980. After early retirement from Phillips, he started his own business Priority Cleaning in Beatrice. He then moved to Manhattan in 2002 where he owned GNC stores. He then retired from The Bluemont Hotel in Manhattan in 2014 as the Chief Engineer. Jack enjoyed coaching his boys in baseball, wrestling and soccer. He also enjoyed hunting and fishing, especially with the boys. He loved spending time with family, including watching the grandkids’ sporting events. He was active in the Optimist Club in Beatrice, Beatrice YMCA, Beatrice YRI baseball program, and a member of the Mt. Calvary Lutheran Church in Wamego. Survivors include his wife Pat, sons, Chad Steel (Heather), Beatrice, NE, Corey Steel (Jill), Hickman, NE, and Curt Steel (Jessica), St. George, KS; and seven grandchildren, Tayler and her significant other Brady Workman, Tabby, Payten, Caden, Brycen, Carson, and Jaylynn. Brother David Steel (Shirley), Maumee, OH; Sister Penny Greenlese, Waterville, OH; sister-in-law Lorrie Steel, Toledo, OH; numerous nieces and nephews. Preceded in death by his parents Robert and Bonnie Steel, Maumee, OH; brother William (Bill) Steel, Toledo, OH; brother-in-law Rob Greenlese, Waterville, OH. A memorial service will be held at 11:00 a.m. Saturday, July 29, 2017 at the Mt. Calvary Lutheran Church. Visitation will be from 6:00 – 8:00 p.m. Friday, July 28, 2017 at the Stewart Funeral Home of Wamego. In lieu of flowers, memorials are suggested to the Leukemia & Lymphoma Society, Homecare & Hospice of Manhattan, and the University of Nebraska Cancer Center, and may be left in care of the Stewart Funeral Home, PO Box 48, 66547.